October 25, 2013. Happy birthday, Joaquim! Reaching 83 is a milestone in anyone’s life (one which I would also like to experience(!)) and today I would like to share with my readers some snap shots of Joaquim’s life in chess. Enjoy! 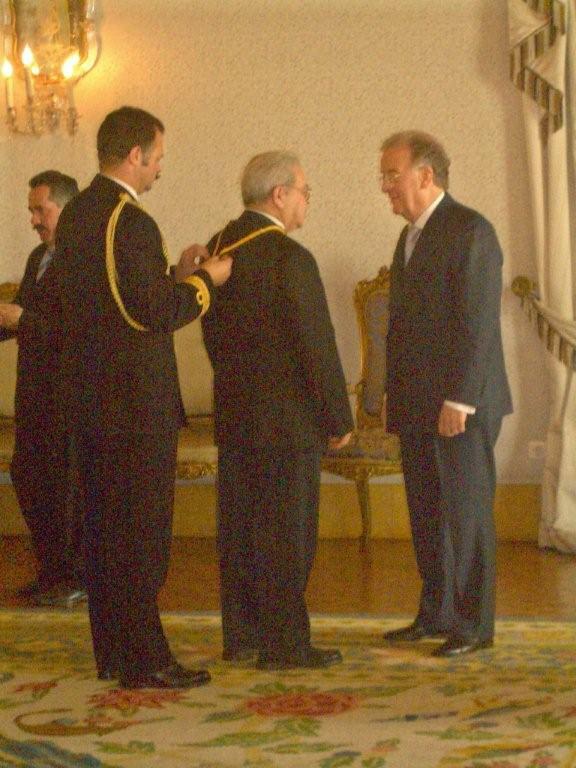 On March 1, 2006 Joaquim Durao was awarded by the President of the Republic, Jorge Sampaio, the ”medalla de Ordem de Mérito” (degree of Comendador) in a ceremony at the Palace of Belem. 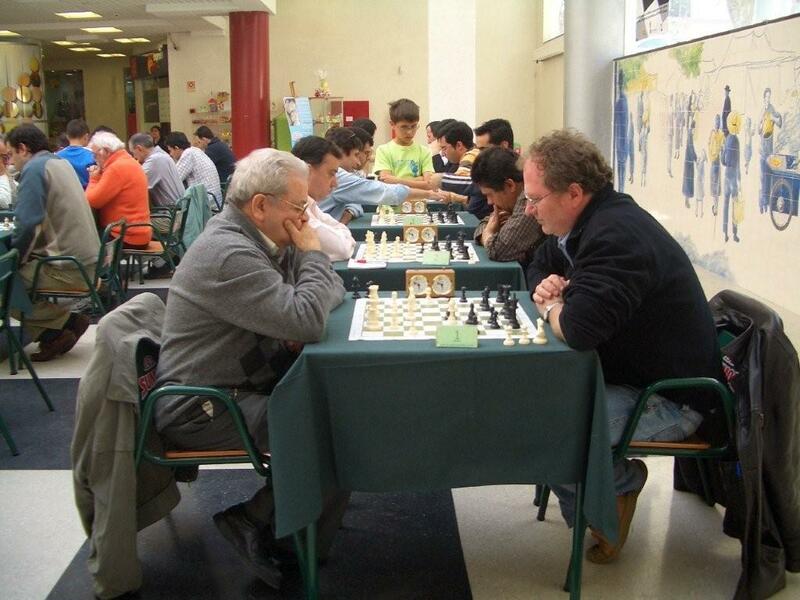 International Master Joaquim Durao is the best known Portuguese chess player in the world and a living legend in his own right. Thirteen times champion of Portugal (!) 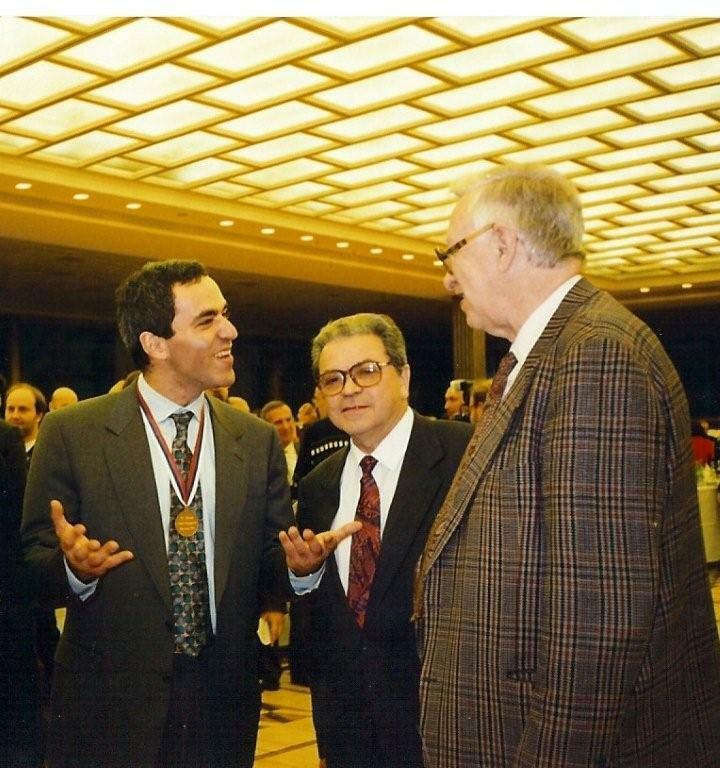 and member of the National Team 10 times, 3 times President of the Portuguese Chess Federation (FPX) and Vice-President of FIDE in the mid-1990’s, Joaquim is well liked and highly respected by everyone. 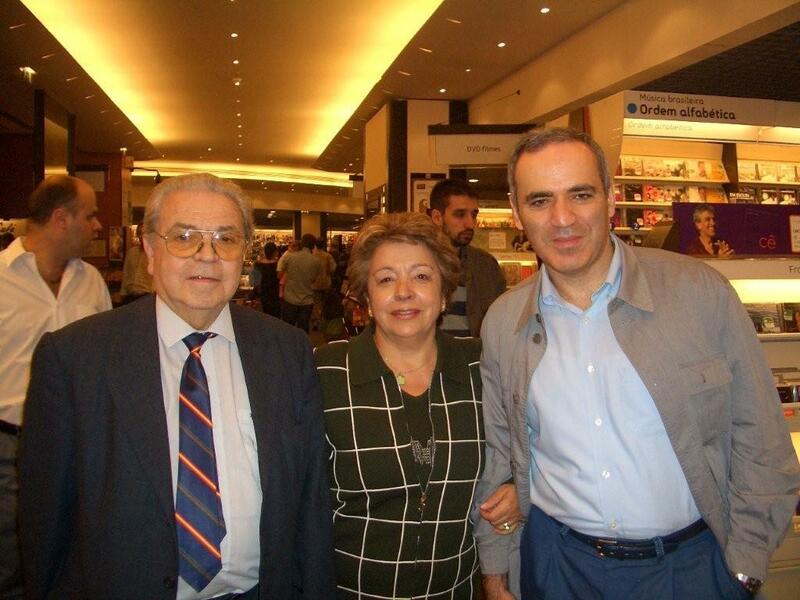 He is truly Portugal’s ambassador at large for chess! Durao also has a chess playing career that spans almost 60 years and has taken him in his travels to more than 80 countries! 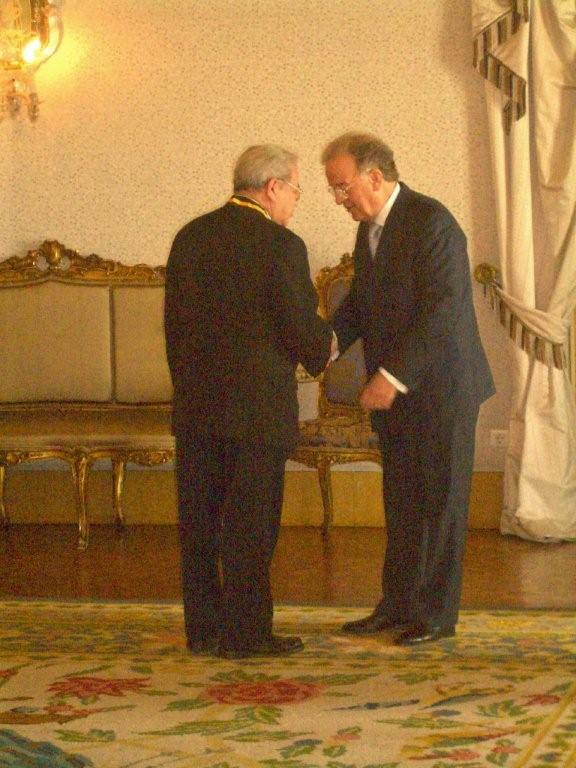 Today Joaquim Durao turned 83 years old. Joaquim is one of the most remarkable people that I have ever met. He speaks about a dozen languages and is highly cultured, capable of conversing knowledgeably on virtually any topic. He is married and the father of 3 chess playing children and 7 grandchildren! 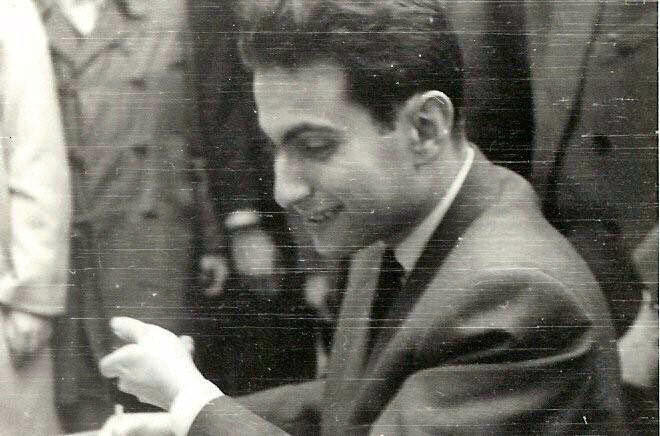 Joaquim was born in Lisbon on October 25, 1930 and learned to play chess at the age of 11 while on vacation in Tuy, Spain. 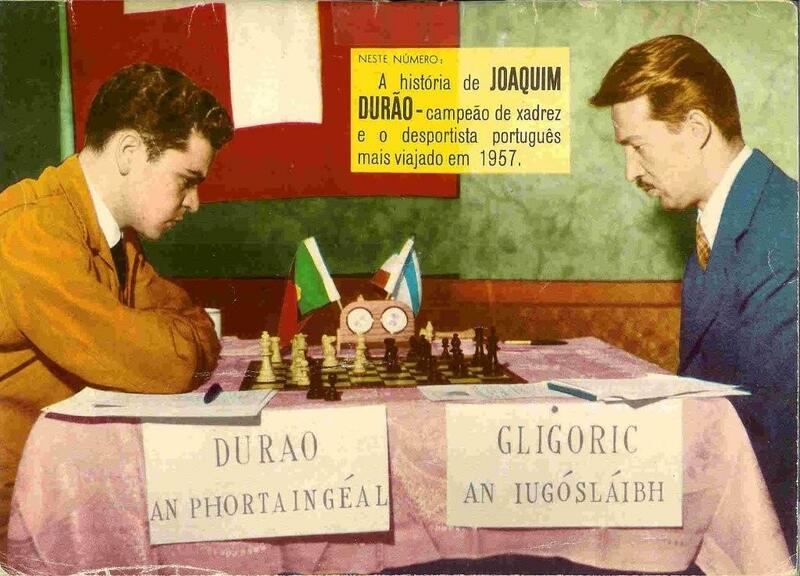 By 1952 Joaquim was already a national master and the best player in the country. He would stay ranked number one for the following 19 years consecutively, and was awarded the IM title in the mid 1970’s. Perez Francisco J. – Durao J. An extraordinarily chaotic position! Both sides have been playing very sharply up to this point and after White’s last move it seems that Durao is finished: his Queen has just been trapped! Will Durao resign? 29… h4!! A truly brilliant move! Durao ignores his Queen and bets everything on his counter-attack against the White King. 30… hxg3 Now the h-file is open and Black threatens mate in 1 move. 31… Be3! A very fine move! Black is down an entire Queen but has a winning attack! The White King is not allowed to escape to the second rank. Now Black threatens mate in 2 moves starting with …NxBd3. 32. Bf1 Rh1! Threatening mate with …Nd3. 33… f3! Another brilliant resource! Black threatens mate in one move! 34. gxf3 There is nothing better. But now the g-pawn can advance! 34… g2! This pawn is going to score a touchdown! 36… Qg3 Probably running short of time, Durao misses 36… Nf3! 37. Kd1 Nd4 and mate in 6 . Fortunately, the text move is good enough to win and brings Durao a well deserved victory. 40. Kb2 Rf2 White can not hold out much longer with the swarm of Black pieces in pursuit! 41. Ka1 The White King has gone as far as it could go, but to no avail. White resigns. A brilliant attack by Joaquim Durao! Above is a 1952 photo taken of Durao (left), Silverio Pereira (right) and Francisco Lupi (center) the strongest Portugese player before the arrival of Durao. 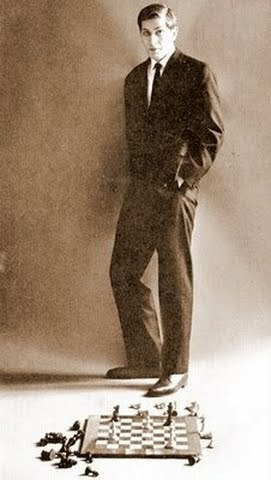 Lupi had twice defeated Alexander Alekhine in official play and was highly thought of by the World Champion, enough so that he helped prepare Alekhine for his ill-fated match with Botvinnik. Lupi died a year and a half after this photo was taken in Madrid. Joaquim and Pomar met many times over the board, and very rarely drew! Below is one of 4 games that Joaquim won against the Spanish genius. Durao J. 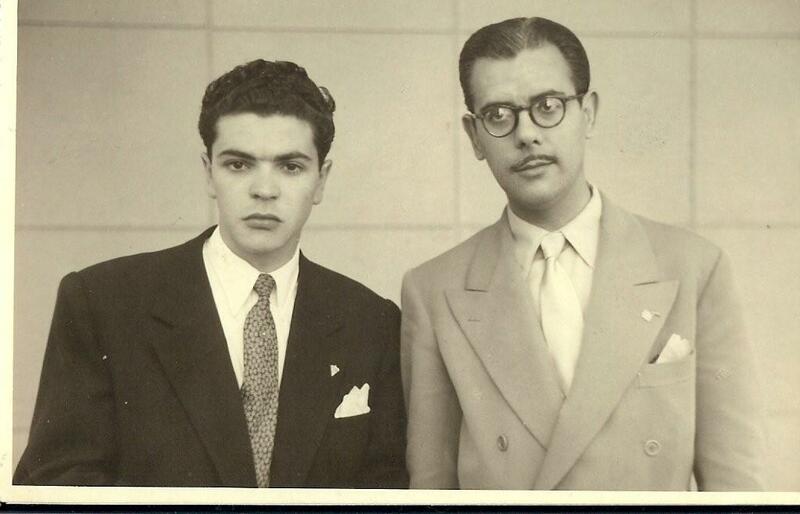 – Pomar S.
Durao with Antonio Medina (1919-2003), Photo was taken in 1951, at the international tournament in Lisbon. 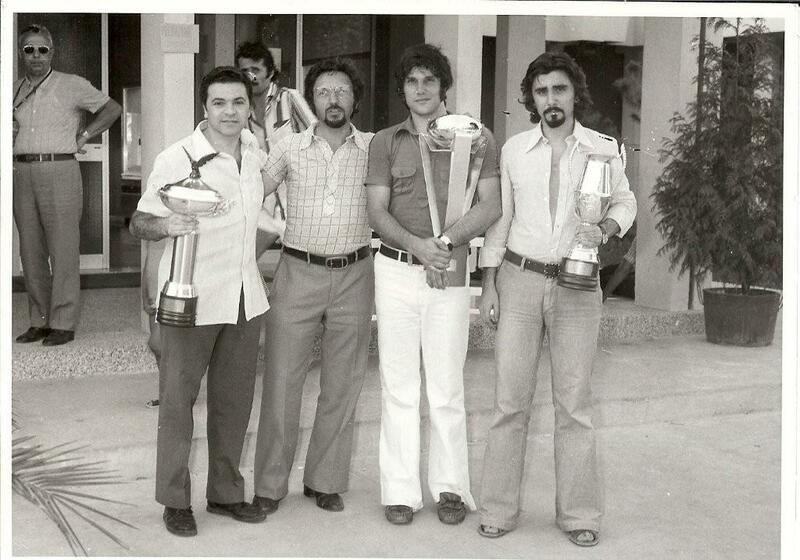 Medina was champion of Spain 7 times. Medina won the Lisbon tournament. A world traveler, Joaquim has played in countless international tournaments (visiting more than 80 countries!) 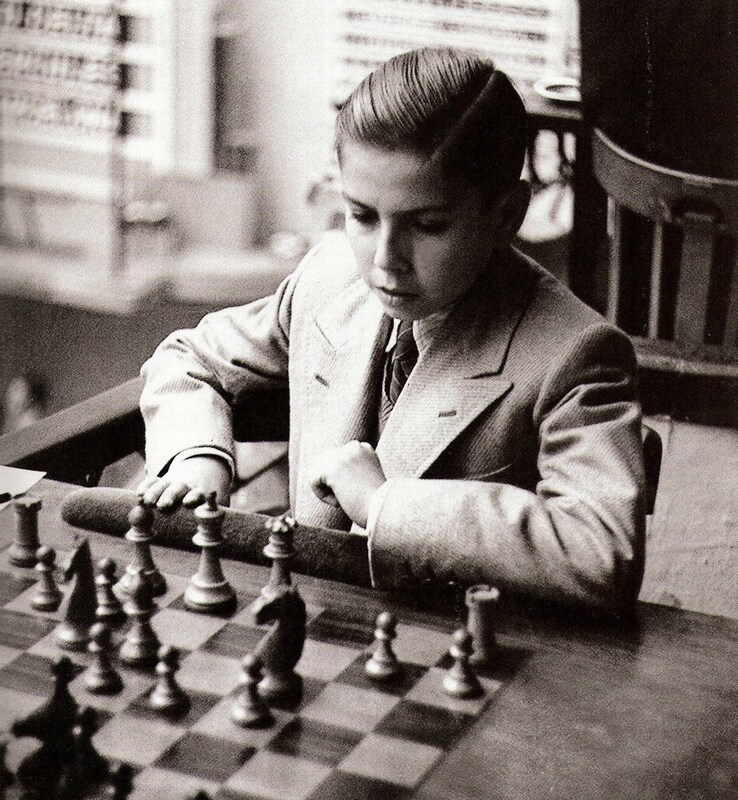 and has met all the world champions, including Bobby Fischer, with whom he got along with very well. 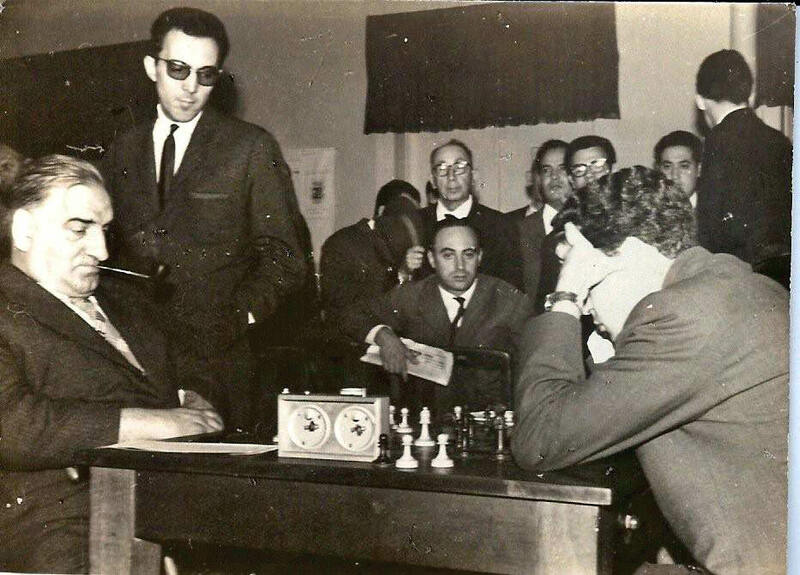 Joaquim Durao and Bobby Fischer first met each other in the early ’60s at an Olympiad and maintained a cordial relationship throughout the years. 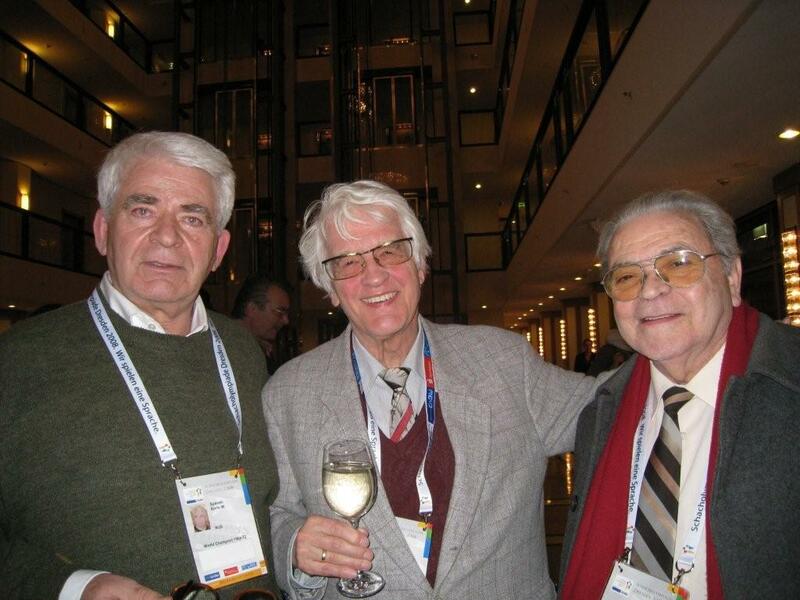 They were paired against each other at the Havana Olympiad in 1966. Fischer was crushing everyone at that Olympiad, and he also won one of his best games against Joaquim. An anecdote that Joaquim told me about this game is that right before the game Fischer asked if it would be alright if he could eat during the game: Fischer had just observed a religious holiday and was now famished! Joaquim agreed, and so a small dinner table was set up beside the chessboard, and Fischer ate while he played! From left: the ambassador Gonzaga Ferreira, William Addison, Francisco Rego, the yougoslav chess journalist Dmitrje Bjelica, the common friend who introduced Durao to Fischer during the Leipzig Olympiad 6 years earlier,Robert Byrne, Maria de Lourdes – the ambassador’s wife-, Bobby, Joaquim Durao and Antonio Rocha. The Havana Olympiad was the first mediatic opportunity for the Castro regime to show the rest of the world how much Cuba had progressed since taking power in 1959. No expenses were spared in making sure that this would be the best Olympiad ever! As an example, each team was given a very expensive gift, shipped to any country of destination: a copy of the official chess set used as well as the table and inlaid board! Joaquim still has his at his home in Lisbon! 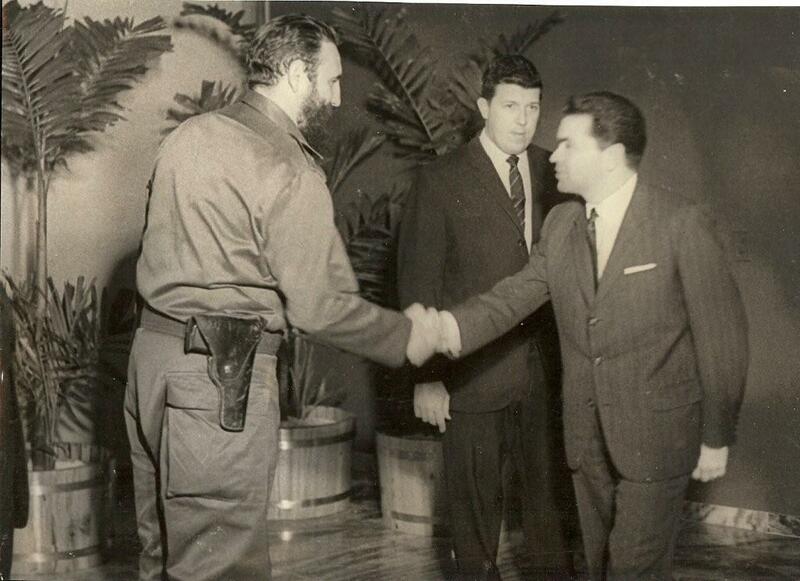 Fidel Castro welcoming Joaquim Durao. The person in the middle was either a secretary or part of the security. 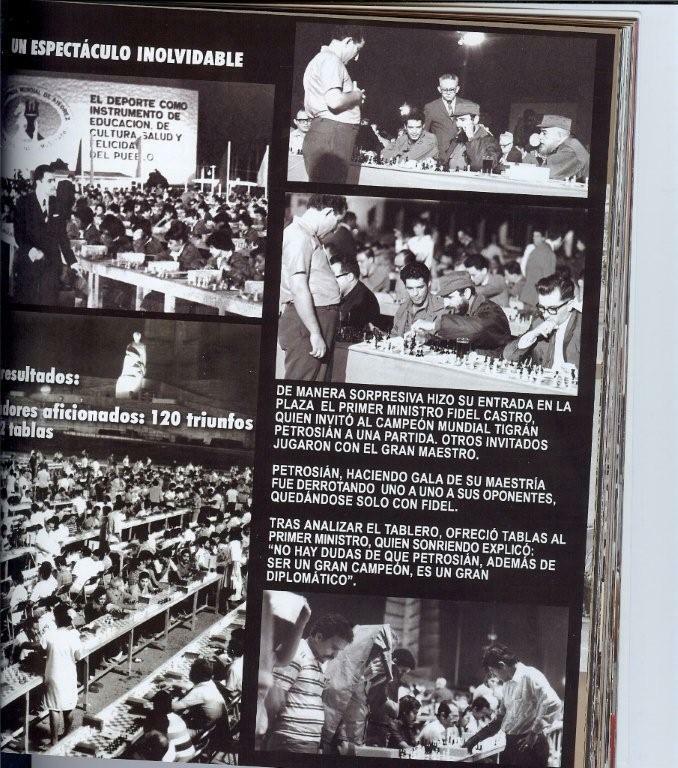 This is scanned from a magazine that Durao’s son Miguel found while visiting Havana a number of years ago. Durao can be seen giving an exhibition in the upper left hand corner! Fischer R. – Durao J.
Durao J. – Tal M.
An interesting position: White has two Knights and Black has two Bishops. But the Black King is a bit open and the Bishops are presently neutralized. This gave Durao confidence in starting an attack against the World Champion. Durao can maintain a slight edge against the world champion with 21. Rc1! Qb3 ( not 21… Qd3? 22. Nd5! and Black is lost) 22. Qe2 and Tal has to be careful: 22… Kh8?! 23. Nxb5! 24. Rf3 Bf8! 25. Qe3 a5! 26. Rg3?! Joaquim insists on continuing the attack. 26. Rc1! is about equal. 26… Rxg3 27. Qxg3 b4! 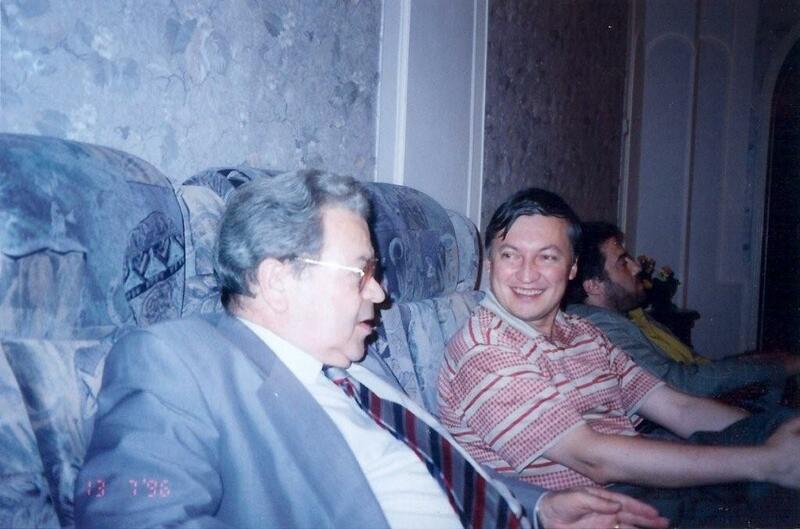 Joaquim and Anatoly Karpov having a friendly conversation at Karpov’s home in Elista (1996) at a private dinner thrown to celebrate Anatoly’s victory over Kamsky. Joaquim prefers to attack, regardless of whether he is Black or White ; whether he is playing Tal or a duffer. To him the initiative is a dangerous weapon , as many a strong player found. The following game is one of Durao’s best efforts in beating a world class grandmaster. 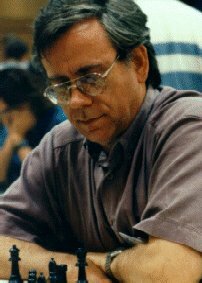 Czech born Jan Smejkal (b.1946) was one of the strongest grandmasters in the world in the 70’s, and had a reputation of being a hard man to beat. In the following game Joaquim completely outplays the young Czech grandmaster, builds up threats on the King side, and in the latter’s time trouble succeeds in crashing through. Durao J. – Smejkal J. 20. b4! d5 21. Nxd5 Nxd5 22. Qxd5 Qe7 23. Qc5 Qf6 24. Bg5 Qxf5 25. Bd3 Qe6 26. Rf1! Feller J. – Durao J.
Praia da Rocha ZT 1969. 1. e4 e6 2. d4 d5 3. Nd2 Nf6 4. e5 Nfd7 5. Bd3 c5 6. c3 Nc6 7. Ne2 Qb6 8. Nf3 cxd4 9. cxd4 f6 10. exf6 Nxf6 11. O-O Bd6 12. Nc3 O-O 13. Be3 a6 14. Na4 Qc7 15. Rc1 Ne4 16. Qc2!? 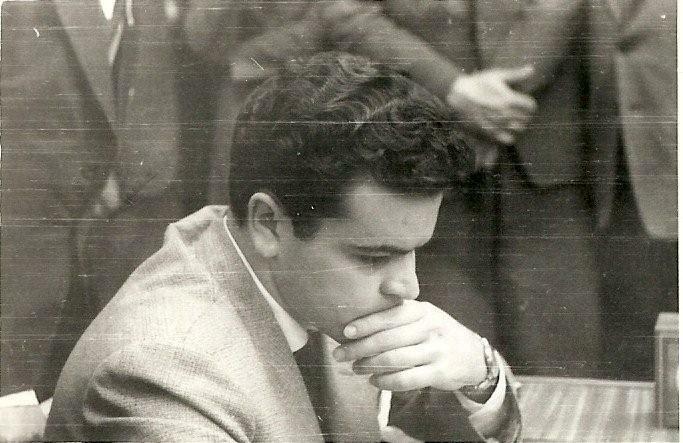 Joaquim Durao has spent a lifetime promoting chess in Portugal as a player, journalist, chess politician and good will ambassador. Joaquim Durao attending the 92nd anniversary of Rui Nascimento, chess player, poet and musician. Joaquim with a young chess fan. 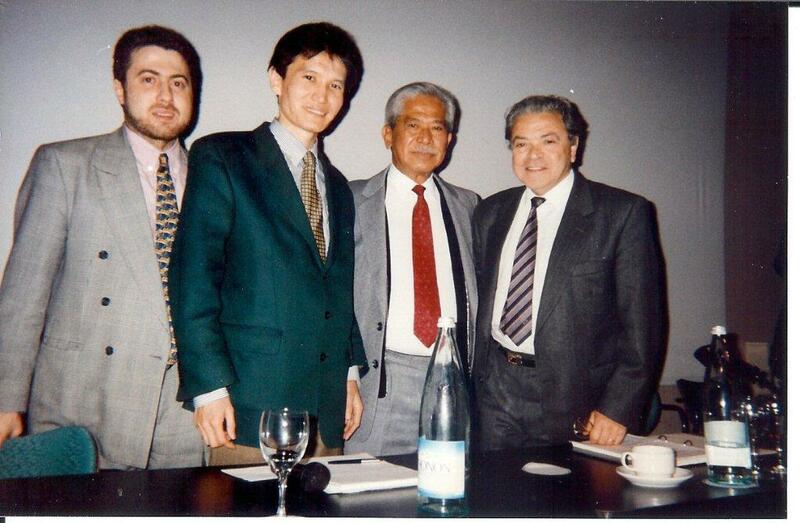 August 1995 at Lausanne. 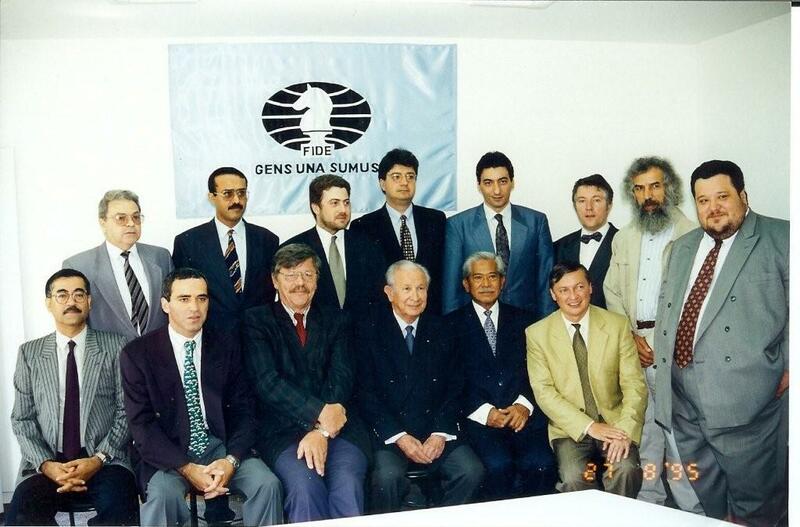 FIDE with the IOC. Samaranch is in the centre. 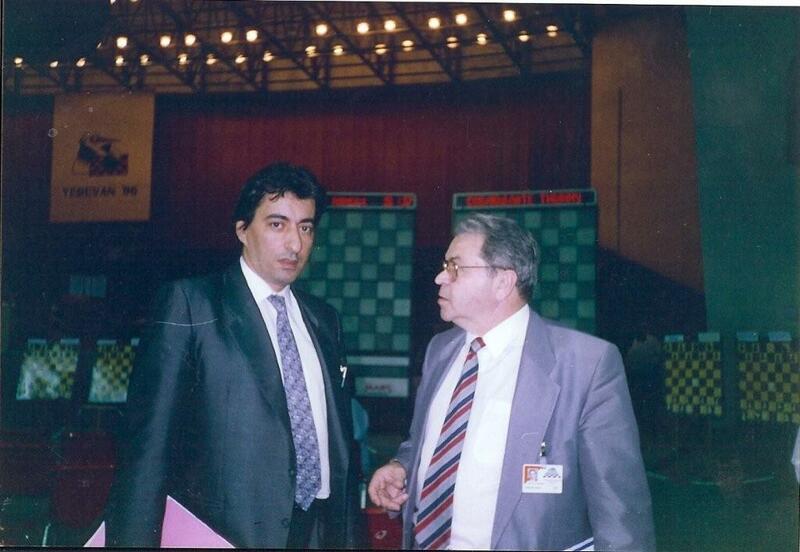 One of my fondest memories is driving back to Portugal with Joaquim Durao after the annual international tournament in Seville in 1993. He suggested that we stop briefly in a small city called Zafra, because he wanted to show me something interesting…. Joaquim brought me to the birth place of the legendary Ruy Lopez de Segura, a sixteenth century priest (and Bishop)! In Zafra, Ruy Lopez is the most famous native celebrity. His birth is celebrated each year. Ruy Lopez is a name that every chess player knows. Author of one of the first books on chess, his name is given to perhaps the most important opening in the game! 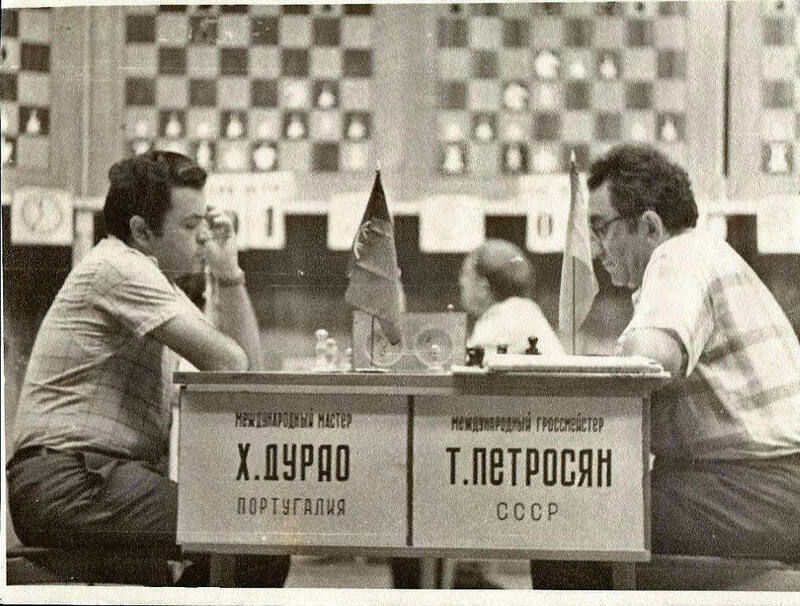 Ruy Lopez wrote some good advice for the serious player that is still useful today: place the board so that the sun enters your opponent’s eyes!